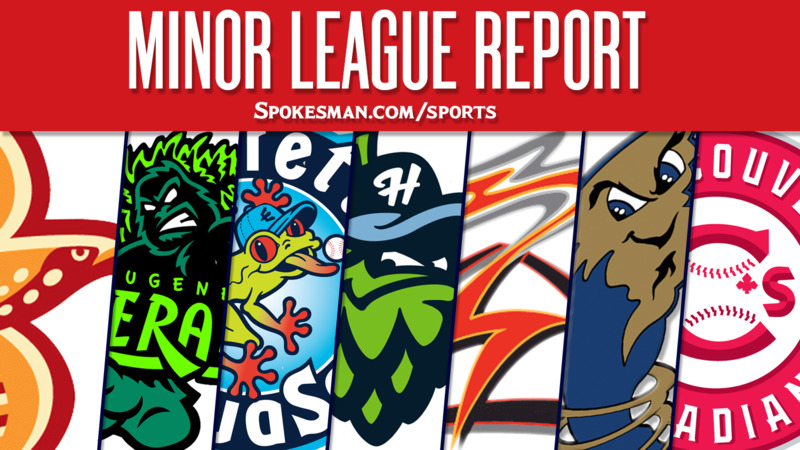 Spokane 5, Tri-City 3: Isaias Quiroz hit a broken-bat single to plate the go-ahead run in the eighth inning and the Indians (2-0) handled the visiting Dust Devils (0-2). Eugene 3, Salem-Keizer 2: Fernando Kelli went 2 for 3 with two RBIs and two stolen bases and the Emeralds (2-1) beat the visiting Volcanoes (1-2). Kelli leads the circuit with 22 stolen bases. Yan Del La Cruz struck out three over two innings for his first save. Everett 3, Vancouver 2: Troy Dixon hit a walk-off homer and the AquaSox (2-1) edged the visiting Canadians (1-2). Dixon went 2 for 3 with two RBIs. McGregory Contreras hit a pair of homers for Vancouver. Hillsboro 5, Boise 2: Jose Caballero hit a two-run home run and the Hops (2-1) topped the visiting Hawks (1-2). Tra Holmes went 2 for 4 with a run and his 19th stolen base for Hillsboro. Round Rock (AAA) 4, Tacoma 2: Hanser Alberto and Nick Torres delivered run-scoring singles in the eighth inning and the Express (51-53) beat the visiting Rainiers (51-53). Alberto finished 3 for 4 with a run. Tyler Wagner went six innings and allowed one run on five hits and two walks with three strikeouts. Jeffrey Springs struck out two over two scoreless for the win (1-2). Frisco (AA) 6, San Antonio 5: Luis Yander La O went 3 for 4 with two RBIs and the visiting RoughRiders (44-60) beat the Missions (61-42). Destin Hood hit a solo homer, his eighth while Michael De Leon and Carlos Garay added three hits apiece. Lynchburg 3, Down East (High-A) 2 (10): Free base runner Alexis Pantoja scored on a fielder’s choice and the visiting Hillcats (48-53) beat the Wood Ducks (46-59). Ricardo Valencia homered for Down East, his second. Hickory (Low-A) 5, Greenville 2: Bubba Thompson went 3 for 4 with a run and RBI and the visiting Crawdads (50-51) beat the Drive (43-59). Yohel Pozo added a solo homer for Hickory. A.J. Alexy struck out six over five innings and allowed two runs on seven hits and a walk. Published: July 27, 2018, 5:55 a.m.